Former England boss Karl Harrison has joined James Lowes' backroom staff as assistant coach at relegated Bradford. Lowes, who failed to save the Bulls from the Super League drop after taking over as boss in June, previously worked as Harrison's assistant at Salford. Harrison, 50, returns to Bradford after more than a decade, having served as Brian Noble's number two at the club. He told BBC Radio Leeds: "Jimmy has progressed as a coach, and I have no qualms at all about working under him." The ex-Great Britain and England prop left his role as boss of Championship side Halifax earlier this month. "Everybody within the game expects Bradford to be in the upper echelons of rugby league - and at the top end of the upper echelons of the sport," said Harrison. "It is also a fantastic opportunity for me to work alongside Jimmy (Lowes) and try to get this great club back to where we think it belongs. "Jimmy understands he probably needs some assistance regarding the Championship, and I've been in the Championship for five years. There's a vast difference to Super League in the way the game is played and refereed. "The game of rugby league in this country needs a strong Bradford Bulls, and it will be all guns blazing for the start of the new season." 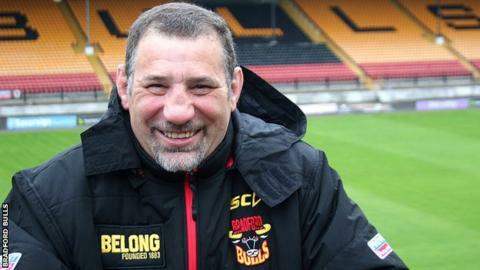 Harrison completes a new-look coaching team at Odsal which sees retired captain Matt Diskin take over as Under-19s head coach and former Featherstone Rovers boss John Bastian come in as Bradford's new head of youth. England's strength and conditioning coach Gary Dempsey has been given the same role with the Bulls.